Brave New Eco is looking for someone special to join our small, dynamic and committed design team. We are a happy productive studio in which everyone wears a number of different hats and brings a range of skills to the table. We manage multiple projects and clients so our team members need to be happy having their heads and hearts across several diverse elements at once. Our studio atmosphere is supportive, dedicated and fun. We are located in a Merri Creek-side building of like-minded businesses, and work in a very beautiful light filled space with a sunny deck and native gardens outside. We are looking for a designer to join our team on a permanent part-time basis - someone who would benefit from an independent flexible work environment; who has a passion for sustainable design; and has the relevant technical skills to contribute to our projects in a meaningful way. - Must have relevant qualifications and 3+ years professional experience in an Interior Design or Architecture practice. - Must be competent in construction documentation and 3D renders using REVIT. - Familiarity with the residential building code, construction documentation conventions and the stages of design and tender process. - Competent using Photoshop, Indesign and Illustrator. - Experience with residential design including kitchens, bathrooms, and custom joinery. - Experience with client presentations and liasion. - Experience with contract administration. - Experience specifying appropriate interior finishes, fittings and surfaces. - Passive solar design principles; sustainable design principles and product knowledge; and/or permaculture knowledge would be a bonus but is not essential. We can provide training and resources to up-skill in this area. - Competent use of Excel and other microsoft office products. - Research and writing skills. - Work is on a permanent casual basis and is PART TIME. Work/ life balance is very important to us, this position would suit someone wanting a part-time study or family-friendly workplace. - If you are interested in this opportunity, please email us with some information about yourself, a resume with relevant experience, and a folio or examples of your work. - We will respond to inquiries by the end of Feb 2018. - Feel free to email us with any questions. 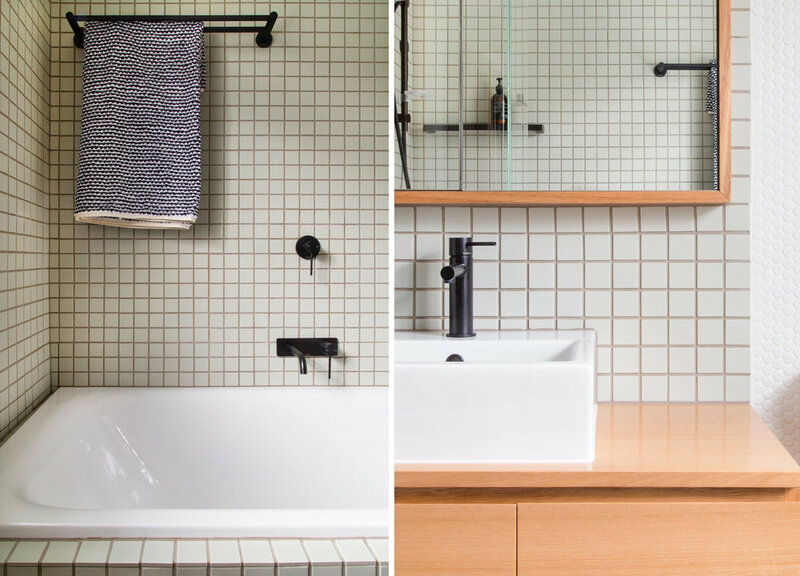 This project is the home of clients totally committed to living resourcefully in small spaces. These guys walk-the-walk and talk-the-talk - willing to do everything they can to reduce their energy use and create a low impact lifestyle for their family. I first met Zoe and Cameron when they came to chat with me at a 'Speed date a sustainable expert' event a few years back. When they got back in contact they had been working with Matt from Greensolar Designs to resolve a small extension design (building out to a boundary wall on one side) containing a third bedroom, light-well and a study. After realising they could add two extra rooms and that the modestly-sized Collingwood cottage could really work for their family long term, they decided that they would need to include a renovation of the kitchen, bathroom, laundry, study, living room, and bedrooms. BNE was engaged to design these alterations including lighting, interior + exterior finishes, window + door furniture and soft furnishings. It was a pleasure to collaborate with Matt to create a modest, hyper-functional, super-cute home. Above: The kitchen contains an induction cooktop, new highly efficient appliances, and beautiful matt black Paperock benchtops made from recycled bamboo and paper. Joinery was kept simple, with a combination of laminex and Vic ash veneer. We started with the notion that a reconfiguration of the interior zones and good joinery design was the key to the small-spaces working for the family. We re-arranged their current furniture to better utilise the open-plan living spaces so they could test out a new layout whilst the design was being developed. In order to keep the kitchen small and simple, a metre wide extension to the boundary wall was suggested, allowing a walk in pantry to be included to allow for bulk purchasing and overflow appliances. Above: The ventilated plywood-shelved walk in pantry was designed to house the Thermomix and toaster - keeping the kitchen bench space clear. Above: Built-in robes and drawers were added to each room, with handmade hardwood handles by a local joiner. A study was designed with space for books and two desks, one standing and one sitting. The interiors were painted throughout with non-toxic paints and timber sealants, retrofitted with LED lighting, eco-rated joinery materials were used and no MDF was used for mouldings or doors. Above: The bathroom and laundry were reconfigured to allow for a large linen press for household storage. Handmade timber vanities were installed and custom mirror surrounds made with the left-over timbers. Above: The bathrooms are compact but work a treat. Matt porcelain tiles in soft green and charcoal, combined with matt white penny rounds are durable and provide interest in the small space. Above: Built-in-robes included drawers and a "play and study" nook in the children's room to reduce any need for extra pieces of furniture and keep the rooms open and spacious. Water tanks, fully retrofitted insulation, a PV array, solar hot water, secure bike storage, and security window screens and doors for cross-flow ventilation complete the project making it an outstanding example of a sustainable retrofit home, not only in energy use but in encouraging sustainable lifestyle habits for this family and any future inhabitants. Above: Brave New Eco also completed a landscape design featuring decking and built-in productive garden beds, composting systems, and adjustable exterior shading. All photographs by Emma Byrnes. BNE has completed some workplace fit-outs in the last couple of years, alongside our residential work. Just to give you a taster we thought we would show you our own awesome creekside design studio in Northcote. When we found this studio we knew it ticked all the items on our wish list for the ultimate workspace. It is a sustainably retrofitted industrial building with a unique bonus - a 100 year lease on an acre of creek frontage - and a deck off the studio overlooking the native trees and Ceres environment park. Seeing the adapative re-use and development of this industrial park on the edge of an important urban wildlife corridor is so encouraging. Erin and Henrik Ender, the architect and designer owners of Big Bang studios have not only developed this land but have contributed positively to the surrounding ecologies and community, activating the area socially and restoring a neglected and polluted creek frontage. They have also created an extraordinarily productive work environment, in which, you can step out at any time during the day onto the deck and have a few moments with the birdlife. We feel very privileged to be able to work from here, and our studio is multifaceted - part office, part maker-space, and part sanctuary (and occasional party venue). Our workspace is perfect for our needs, as comfortable and homely as it is a functional professional environment. Our own studio design is a pretty organic and ongoing process but for our commissioned workplace designs we take a more refined approach - creating resolved and inherently resourceful, 'feel-good-to-be-in' workspaces. Below we have summarised just some of the considerations we use to embed sustainable objectives into these projects. Using a human and environment-centered approach, we focus on both the health and productivity of the users and the resourcefulness and adaptability of the space. DIVERSITY AND ORGANISATIONAL CULTURE: Our designs are specifically curated for a business or organisation's individual structure, needs and personality. We lean away from bland corporate environments to create spaces that communicate the identity and ethos of a business and reflect the diverse personalities of the people within it. This may be by using locally designed/made elements, creating meaningful connections between object, maker and community. We may commission artworks or support art projects that communicate relevant themes. These gestures positively affect end-user perceptions of the work environment, enhancing comfort, amenity, connection and quite simply, making a person feel at home at work. FUNCTIONAL COHESION: Functional amenity is created through logical and intuitive ease of movement, by using ergonomically optimised furnishings and joinery and by providing adequate and accessible storage. Interior design is a potential place to solve workplace problems around productivity, distraction and communication. Each workplaces way of operating needs to be firstly understood, and then ultimately improved by the process. Creating a healthy, pleasant workplace includes finding out what employees need from their environment to do their jobs well then responding to these needs within the design. SUSTAINABILITY OF MATERIALS: We positively select for sustainably sourced materials, furnishings and fittings, that are either good environmental choice certified, energy efficient, low VOC, locally made or contain recycled materials. We take into consideration the life cycle impacts of a product. ADAPTION AND RE-USE: We always start from a point of optimising the potential of existing features and resources of both the building and the existing furnishings. High quality, appealing and essential existing elements are often integrated with new furnishings. We aim for our workplaces to be future-proofed by designing in the flexibility to adapt to changing needs and growth over time. This may be through the use of modular or flexible systems or spaces and/or through selecting furnishings that allow for partial replacement, repair and upgrading. The value, enjoyment and longevity of our spaces is enriched by making classically appealing design choices in high-quality materials. Where possible we source second hand or upcycled furnishing and materials. We avoid applying a blanket solution to a whole environment and draw diverse elements together for flexibility, personalisation and interest. This diversity and quality creates interior spaces that withstand robust use and resist becoming outdated. HEALTH AND WELLBEING: Evidence-based design methods are used to create pleasing and productive spaces that support human health and happiness. This involves the careful consideration of sound, lighting, indoor air quality, colour and artwork from a psychological and physiological health point of view. Improvements in indoor air quality can be achieved by minimising the use of materials that off-gas chemical pollutants, and by the beneficial installation of plant life to absorb remaining indoor pollutants. Providing pleasant visual aspects for users is possible with the use of carefully selected artwork, natural materials and textures and colour to create visual interest. PLANTSCAPING: Indoor environmental quality (IEQ) can be dramatically improved by introducing plant life. This is due to the remarkable capacity of indoor plants for air purification through phytoremediation. Plants can absorb and metabolise airborne contaminants such as particulate matter (fine dust), and the volatile organic compounds (VOCs) released from our furnishings, paints, adhesives, building materials, paper, textiles and plastics, found in high concentrations in well-sealed indoor environments. A University of Technology Sydney study on plants and indoor air quality found significant improvements in recuding stress and negative feelings with the introduction of plant life (up to 50 and 58 per cent respectively). Brave new eco specialises in plantscaping environments, specifying appropriate quantities and types of plant life in low care systems. You can read more about using plants in interior environments here. This apartment for professional business coach Ange and Bodie her dog, was one of a boutique development in Port Melbourne with original high quality interior fit-out by Hecker Guthrie. We were engaged to personalise the storage and joinery for Ange's needs and help furnish the space, plus provide a plantscaping package. Existing exposed concrete ceilings, white paint, concrete, marble and washed-out American oak timber joinery detailing provided a pleasing base palette to work from. To ensure cohesion we worked with this existing 'feminine industrial' material palette enhancing the original features rather than diluting them. We started with a kitchen joinery unit - made to fit onto the original kitchen, yet reading as a distinct form. This joinery storage and shelving had to straddle both the functional needs of the kitchen yet sit comfortably with dining room furniture. Built by Auld designs, the American oak veneer unit was carefully oiled with non-toxic Osmo oils. Locally crafted MadeMeasure leather cabinet tabs were perfectly toned in the space. We replaced the kitchen wall light with a handmade Anchor ceramics wall light in dove grey, to match the existing grey-blue range-hood. This we mounted on a timber plinth, adding extra timber detailing and casting the light right where it was needed in the work zone. The master bedroom was too small for anything else other than a queen bed and one bedside, and the resulting feeling was a 'bed in a box' with little visual interest around the bed. We solved this by removing one of the built-in wardrobes and installing a custom drawer unit and open shelving above. This little nook articulates the small space, creating an opportunity for display and the drawers provide more useful storage than cupboards. We designed a floating bedside table that maximised floor space and added a hanging bedside lamp from Anchor Ceramics on the other side to remove the need for a second bedside. A wall mounted shelf provided a platform for vertical interest. In the second bedroom (which triples as a study, a yoga room, and a guest bedroom) we removed a double door wardrobe and built a desk into the alcove, meaning the floor space could remain clear for yoga sessions and be easy to adapt with a fold out queen bed for guests. Allergic to waste as we are - we recycled all the removed cupboards and light fittings into another project. Finally we sourced a few key decorative items and furnishings and supplied a comprehensive plantscaping package, choosing low maintenance house plants appropriate to each space's light levels and optimising the number of plants to the space for air purification. The outcome is a compact apartment yet rich in texture: simple, yet warm and calming. I met with the owner the other day and she told me that she had not bothered to make any holiday plans for the summer as she loved being in her home so much. In her words "The greenery in my space is gorgeous and has totally improved the feeling of my place....My home is a total sanctuary.. easy to live and work in, a total delight". Most of our homes have a bit of outdoor space in which to make a garden. Time spent in a garden can induce a sense of peace and calm or mindfulness. As well as creating beauty, a garden brings a connection with nature, its seasons and rhythms. The understanding of this connection, of working with nature to nurture oneself, is most clearly expressed in a permaculture garden. Miri Ransom works in collaboration with Megan in the Brave new eco team designing landscape solutions and creating detailed planting plans. 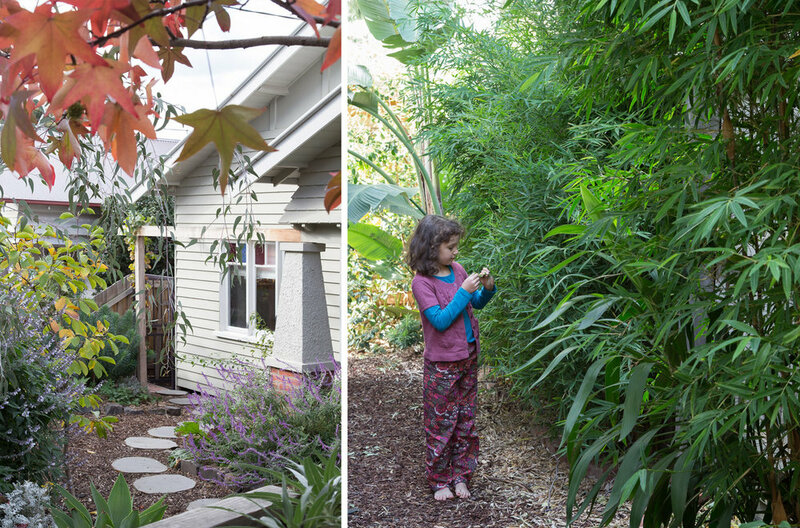 In this article she outlines our particular approach to urban permaculture design; Firstly to create environments that match the landscapes and inhabitants physical and practical resources, and secondly to create productively useful and ecologically beneficial environments, that are also aesthetically beautiful. You can hear more of Miri's garden musings at her Daily Gardener blog. Permaculture is the conscious design of productive, sustainable and resilient ecosystems in which human beings and nature coexist harmoniously. Designing a garden is an opportunity to engage with the key permaculture principles of care of the earth and care of people. A permaculture garden design begins with two questions: how could your custodianship of a garden have a beneficial environmental impact? And in what ways could a garden enhance the quality of your life? The initial phase of the permaculture design process is observation. This involves conducting a site survey which takes into account the aspect and topography of the site, its soil makeup, local climate, movement of water through the site, prevailing winds and existing landscape features such as established trees, as well as the borrowed landscape beyond the fence. Drawing on careful observation, the garden design is able to harness the advantages of the site and to mitigate any disadvantages. While permaculture gardens are designed to be less labour intensive than conventional gardens – because we work with nature rather than against it, the design needs to take into account the human resources available to be drawn on. How much time do you want to devote to your garden? Do you have an ambition to grow some of your own food? Do you want your own orchard and chickens? Or maybe a few herbs and salad greens is more realistic with the time you have available. A garden extends the living areas of the house into the outdoors, providing tranquil private spaces that are shaded and cool in summer while allowing winter sun in. The placement of trees, shrubs and climbers in the garden can enhance the passive solar capacity of a building design. Deciduous plantings are sited to the north, east and western sides of house while evergreens are situated on the south side of buildings. The hard landscaping component of the design should sit lightly on the earth both visually and in terms of its environmental impact. A permaculture design requires a careful consideration of the potential toxicity, embodied energy and durability of any materials used in the construction of the garden. Our preference is for gardens with minimal hard landscaping, using natural and recycled materials, where the planting design is the dominant feature of the landscape. It is important that the landscape design employs strategies to capture and use water effectively. Water tanks and efficient drip-line irrigation systems divert catchment rainwater away from stormwater drains and cycle it back into the garden. Another key consideration in a permaculture garden design is the building of nutrients and organic matter in soil. The soil’s water holding capacity is improved by increasing its humus content (the dark organic matter in the soil formed from the decay of plant material), which also enables carbon to be sequestered in the soil. Because digging in the garden releases carbon from the soil, we aim for minimal soil disturbance, instead using deep forking to gently loosen the soil and spreading manures and composts over the soil surface. Mulching is crucial to minimise evaporation and protect the beneficial soil microbes. A permaculture garden design also needs to facilitate nutrient cycling. Rather than exporting garden waste products off site through green waste and rubbish collection, we use worm farms, composting systems and chickens to convert the waste into food for the garden. Ultimately the garden becomes a ‘closed’ system, feeding itself without the need for toxic and expensive external inputs such as fertilisers purchased at the garden centre. In a permaculture garden design, much of the available growing space is reserved for productive or edible plants. In a relatively small amount of time a productive permaculture garden yields enough home grown fruit, herbs and vegetables to share with friends and neighbours. Productive plantings will be a mixture of perennial plants such as fruiting trees, and annual cropping vegetables. The planting design includes companion or guild planting to attract beneficial insects to the garden and deter pests, minimise weed invasion and contribute nutrients to the soil. A well-designed garden is beautiful as well as sustainable. Non-productive areas of the garden are designed as habitat rich perennial and self-seeding annual plantings. This naturalistic planting design is beautiful as well as wildlife friendly, providing cover, water and food for birds, reptiles and insects. Consideration is given in the design to the ecological compatibility of plant species as communities, as well as their site suitability in terms of climate, rainfall, light levels and soil type. For a design to work, the right plant needs to be put in the right place. In many cases a naturalistic planting design will make use of native and indigenous plants. However there is a huge range of climate appropriate exotic plants that can provide habitat and food for wildlife. When exotic perennial plants are integrated with native plants we are able to extend both the season of interest in a garden and its aesthetic possibilities. Plants are selected for their form, texture or colour, or sometimes the way they catch the light, and are combined to create beautiful and atmospheric planting schemes. If you consider the total amount of hours we spend in various parts of the home, bedrooms are by far our most frequently inhabited spaces. Good bedroom design contributes to our psychological and physical health and wellbeing, and with careful planning need not be difficult or expensive to achieve. The first question to ask is what is a bedroom for? Bedrooms can be spaces for rest, work, storage and play. For all of their potential uses bedrooms needn’t be very large. East facing windows are ideal in a bedroom. Morning sun, and having a view out a window from the bed are good for the spirit. Locating the bed so you are not looking out the doorway or out windows into the street will increase the sense of privacy. The location of bedrooms is crucial, upstairs can be beneficial in cool climates as the interior heat will collect on the upper floor. In warmer climates placing bedrooms to the south and near thermal mass will help keep them cool. Good bedding can solve most heating problems. Radiant heat can be absorbed and stored by the human body so taking a hot water bottle or another human being to bed is a good old fashioned and highly-effective way to stay warm. Sealing up wall vents, fireplaces and other gaps will reduce both winter draughts and summer heat. Windows that can be locked securely and that open at night, will help to passively ventilate the bedroom and improve indoor air quality. Insect screens are useful to keep mosquitoes at bay. A ceiling-fan will circulate air reducing the need for air-conditioning. North or west facing windows will benefit from exterior shading in summer to keep a bedroom cool. Adjustable exterior blinds or deciduous plantings allow a high degree of adaptability to provide shade as needed. Thermally-effective window treatments are especially important in bedrooms. Heavy lined curtains that have pelmets and run to the floor will effectively trap a pocket of warm air inside. If curtain are impractical or the heaters are under the window then recess mounted honeycomb blinds or face fixed heavy backed roman blinds are the best option. Roman blinds use less material than curtains so can be a good opportunity to using organic and or locally printed fabrics. Preserve limited floor space by running storage cupboards above head height. The alcove underneath can be used to tuck a bed or desk into. 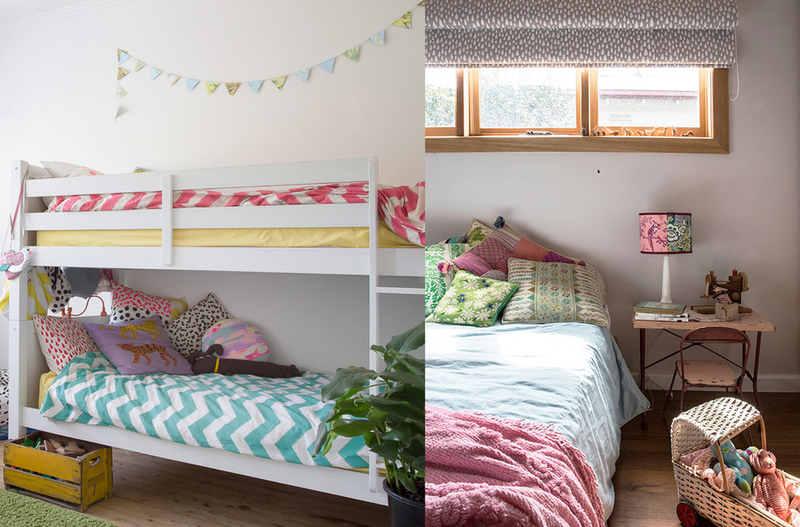 Capitalize on high ceilings by creating a sleeping loft, utilising the space under to fit a wardrobe, desk or another bed. Wardrobes are a cost-intensive part of a renovation, so rather than using mass produced storage solutions, look for creative ways to reuse second-hand cabinets, or hide shelves and racks behind a lightweight ceiling mounted curtain. Keeping furnishings simple will reduce dust build up, that can contribute to allergies, respiratory problems and asthma. Rugs rather than carpet are useful for warmth and softness underfoot, as they can be aired and cleaned regularly. Painted surfaces and composite timber products off-gas volatile organic compounds into the indoor environment so choose VOC free paints and oils for your bedroom walls and furniture, and EO rated timbers for your cabinetry. Leave new upholstery or furniture outside to off-gas for a few days, to get rid of the ‘factory fresh’ smell. Slatted bed bases provide good ventilation around the mattress reducing the occurrence of mould and dust mites. Mattresses are commonly constructed and treated with chemicals in the fabrics and foams containing volatile organic compounds such as antibacterial agents, flame-retardants, PVC’s, bleaches, pesticides and dyes. These chemicals can contribute to allergies, respiratory problems, chemical sensitivities and asthma. Mattresses made of plant-based materials such as organic wool, cotton, hemp, natural latex and bamboo are a safer option. Bamboo and latex are naturally hypoallergenic and dust-mite resistant. If you are replacing a mattress divert it from landfill by sending it for recycling. Ideally use natural fibre bed linens and covers made from organic and ethically produced sources of bamboo, linen, silk or cotton. Wash and line dry new bedding before using it to get rid of any chemical residue from production, or buy second hand sheets and blankets. Try dying old bedding and blankets to give them a new lease of life. Keep digital clock radios and phone chargers away from where you are sleeping and avoid positioning a bed on the opposite side of a wall to a smart meter, refrigerator or other appliance, as these will emit electro magnetic fields most strongly within 1-2 meters. Poorly designed and furnished bedrooms can make us sick while we sleep. By applying a few simple design and retrofitting ideas and carefully selecting the materials that we bring inside a bedroom area, we can create a space that is not just somewhere to sleep, but a place to retreat for relaxation and rejuvenation. This article content was originally published in Sanctuary magazine. In Australia, 80% of us live in urban areas, spending up to 90% of our time indoors. As a design tool, plants are an adaptable, multi-purpose and easily retrofittable element for the home or office. Plant-scaping can be used not only for sculptural and aesthetic effect but to screen, buffer noise, filter light, purify the air and provide ambience. Recent studies also show that plants in indoor environments can have multiple benefits for our health and wellbeing. Our survival is inextricably linked with that of the world’s trees. ‘The lungs of our planet’ capture energy from the sun’s rays and absorb carbon dioxide from the atmosphere to produce their own chemical energy, conveniently releasing the waste product of oxygen. Its no surprise then that photosynthesizing indoor plants are good for air quality - providing a continual supply of oxygen during daylight hours. Perhaps the most remarkable aspect of indoor plants is their capacity for air purification through phytoremediation. Plants can absorb and metabolize airborne contaminants such as mould, bacteria and the chemical pollutants (VOCs) that are released from our furnishings, paints, adhesives, building materials, paper, textiles and plastics, and can be found in high concentrations in indoor environments. These contaminants mean indoor environments are more polluted than the outdoors. A University of Technology Sydney (UTS) study on plants and indoor air quality has shown that plants' ability to remove VOC’s works by a symbiotic relationship between soil and the plant; indoor contaminants are pulled into the root zone where soil micro-organisms convert them into food. The researchers also found that pot size; species; and light and dark did not affect the rate of removal. Carbon dioxide levels were found to be removed by between 10 to 25% and carbon monoxide by up to 90%. Indoor plants can also have a range of cognitive, physiological and psychological preventative and restorative effects. The UTS study looked at the reduction in negative feelings (testing for anxiety, anger, depression, fatigue and confusion) through introduction of plant life found a total negativity reduction of -58% and reduction in overall stress of -50%. Lead researcher of the project and plant scientist at UTS, Dr Margaret Burchett has no doubt that greening the ‘great indoors’ with living plants could play an important part in enabling the sustainable urban communities of the future. She says that increasing our green space indoors could: improve energy efficiency through insulation and temperature control; reduce air pollution; raise spirits and work performance; and improve concentration and attention span. Around 15 to 18 plants per 170 square metre of indoor space could be beneficial for indoor air quality, but even the presence of a single pot plant on a desk could improve someone’s work day. Successfully growing indoor plants is about getting a few fundamentals right. With the below points nailed, you should find your indoor plants thrive with minimal attention. Microclimates - The first rule of success with indoor plants is location, location, location. Different areas of a building may have specific microclimates that make them more suitable for certain species. Light - Plants can be grouped into types that prefer low, partial and bright light. Low light or shade plants can survive with less than four hours of sunlight per day. Partial sun plants need at least four hours of sunlight per day, but not necessarily direct. Full sun plants need at least six hours of sunlight per day. Plants may need to be moved seasonally to avoid or reach the sun and rotated occasionally so that all sides grow evenly. Temperature - Plants prefer stable temperatures, so avoid placing them close to heaters and air-conditioners that cause temperature fluctuations. Locating them near thermal mass can help even out the immediate temperature range the plant experiences. Humidity - Indoor plants have a regulating effect on humidity in all climates, releasing 97 per cent of the water they absorb through transpiration. Plants will work to both raise and lower the humidity levels, maintaining an ideal level of between 30 to 60 per cent. Clustering plants in groups increases the surrounding humidity and creates an ideal climate for healthy plants. Potting and Nutrition - For optimum nutrition plants need high quality potting mix and re-potting as they grow to avoid becoming root bound. Increasing the pot size by only 2 to 3 cm at a time will help avoid rot. Repot, divide and propagate at the beginning of the growing season, placing broken crockery, pebbles or scoria at the base of pots for aeration and drainage. Add a slow release fertiliser or heavily diluted liquid fertiliser such as worm tea periodically. Watering - Over-watering kills plants as often as under-watering so water with small amounts and often, and don’t leave plants sitting in water. Plants will need less water in winter unless the heating is running at high temperatures. Forming a habit of emptying leftover cups and water bottles into plants will help make the job incidental. Some plants like to dry out between waters. Trouble shooting - Cleaning the leaves of your plants with a damp cloth removes dust that reduces the plant’s ability to photosynthesize. Indoor plants are susceptible to mould that can exacerbate allergic and respiratory conditions. Physically remove the mould and apply a good dusting of cinnamon over the soil as a natural fungicide. Move the plant to a well-ventilated area of the house and let the soil dry out partially between watering to prevent the mould returning. Access to light and irrigation systems for indoor gardens can be considered at each stage of the design process. In small existing spaces - On window sills, along tops of cupboards, hanging in rows and corners, on stands, wall-mounted shelves, chairs, tables and stools. Using repurposed elements - Enamelware, ceramic teapots bowls/ cups, tins, crates, industrial metal bins and containers, pellets, aquariums and vases for terrariums. According to the UTS study, any green shoot will remove carbon dioxideand release equal amounts of oxygen with adequate light. However, different species may require different conditions to photosynthesize effectively. The more foliage, the better. Low light - Mother-in–law’s tongues, Janet Craigs, spathiphyllum ‘sensation’, hahnii, peace lily, Aspidistra elatior (cast iron plant). Partial sun - Bamboo palm, kentia, pothos, happy plant, parlour palm, dracaena compacta, orchids. Full sun - Yucca, bird of paradise, ficus elastica, golden cane, dragon tree, bromeliads, lady palm philodendrons, succulents. To lower humidity - Boston fern and English ivy, maiden hair fern, snake plant. To raise humidity - Lady palm, boston fern, gerbera, peace lily, Kimberley queen, florists mum, warneckei. For air purification- Aloe vera, golden pothos ,spider plant, peace lily, english ivy, gerbera, snake plant (mother-in–law’s tongue), heart leaf philodendron, weeping fig, warneckei, bamboo palm. In bedrooms - Orchids, epiphytic bromeliads and succulents release oxygen at night. Australian native plants for indoors - Umbrella tree, black bean, davidson plum, lilly-pillies, grevillea robusta, rasp fern, fishbone fern. This article first appeared in Issue 30 of Sanctuary Magazine. Actively ventilate your home daily. Opening opposing windows and clerestory or second floor windows encourages cross flow and passive stack ventilation. Fly-screens and security screens are a useful addition to your windows and doors to enable good ventilation, day or night, without attracting unwanted insects. Use the middle of the day in winter while your heating is off to get some fresh air in, if your local climate allows. Take off your shoes at the front door. Shoes are one of the biggest sources of indoor pollutants such as lead and pesticides - by removing them you can reduce the dust in your home by up to 50%. Heavy doormats at entrances will also help to reduce pollutants being carried into the home. For a doormat with a social conscience take a look at The Welcome Committee project. Indoor plants contribute multiple benefits to the interior environment including absorbing volatile organic compounds, carbon dioxide, airborne moulds and bacteria, and regulating humidity levels. As well as this, studies have shown that indoor plants have positive psychological benefits. Some resilient indoor plants are Peace Lilies, Mother-in-law’s Tongue, Boston Fern, Rubber plant, Bamboo Palm and Aloe. A regular vacuum with a Hepa filter vacuum cleaner, and both a simple microfibre mop and damp-dust to eradicate particulate matter, will contribute to a healthy interior environment. Receive our news and updates. Brave New Eco provides a range of tailored design and consulting services for new and existing homes. Our interiors and retrofit-driven design approach responds to the way you live and the way you want to live. We put people and environment at the heart of our ecological designs. Find out more here. LIGHT me up! home lighting from lux to led. LOVE YOUR WORK- JOIN OUR SHARED STUDIO! Our last day! And final patch and paint at our beloved @bigbang_studio creekside studio- after four special years we have moved to a new location, so much work was done here and so many good times with @putyourheartintoit @kelseyadabinett @erin.ender @stem_emmalinebowman @dylanbuckee @pipnormanmusic @tj_chpmn @amok_metres @alice.hobday.yoga and so many other good folk. The ’social architecture’ big bang is conceived from is real. Miss this bit of creek and this crew already! Early concept render for the interior of a new home on Merri creek- a design collaboration with @antmartarch and @sblastudio. Windows and in and wall linings are going on so we will soon be able to get started on the 40 unique pieces of custom joinery that we designed for this extraordinary home. Pretty excited to see this one come together. Yikes! I am saying some stuff today on 2019 Talkfest with @buildhercollective. Link in Bio to watch- and lots of other interviews with the like of @bencalleryarchitects @interiorsaddict @lunchboxarchitect amongst other good building and design folk. Check it out!